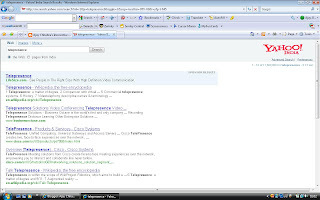 SEO Results Business Octane Yahoo Search on "telepresence"
We have recently initiated the SEO and online promotion project of Business Octane's website ( http://www.businessoctane.com/ ). We did a thorough keywords analysis with the help of our SEO team leader & SEO Specialist Deepak Kamboj and Surbhi Thukral form client's side. The results are mind blowing. Withine few days of one time optimization efforts on a industry generic keyword "Telepresence" which has around 11,800,000 results on http://www.yahoo.com/ Business Octane is top ranked and comes above Cisco. We have recently got a new win, Business Octane, which is operating into the high end technology domain i.e. 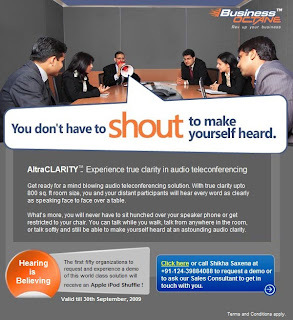 Telepresence Solutions in India. We are engaged with the client on Offline and Online activities. Telepresence has been there for quite a long time but the USPs by Business Octane goes beyond just Life size real presence to getting the real work done, by in terms of automating complete collobartion requirements. For more information please log on to http://www.businessoctane.com/ This attached creative is about an innovtaion in the Audio Conferencing which Business Octane brings to table. You can be sitting/standing/walking in the conference room or even whispering still the other party will be able to hear you crystal clear. You don't have to lean on Star phone. http://www.businessoctane.com/altraclarity.php . Thanks to the entire creative and servicing team at MRM for producing very high quality creative and conecpts and special thanks to the Dy. Manager Marketing at Business Octane ( Ms. Surbhi Thukral surbhithukral@businessoctane.com ) for trusting upon MRM so much.